The Center of the Creative and Performing Arts at SUNY Buffalo holds a major place in the history of new music in America and is emblematic of the adventurous period during which it existed, 1964-1980. Published by Oxford University Press in 2010, this book portrays the Center, essentially an artists’ colony within a university, and its now legendary lineup of musicians. Composers Lukas Foss (the Center’s founder), Lejaren Hiller, and Morton Feldman were the music directors over the life of “the Buffalo group.” The now legendary group of musicians (some would say “musical outlaws”) who participated in the Buffalo group included Pulitzer Prize winner George Crumb, Terry Riley, Cornelius Cardew, Maryanne Amacher, Frederic Rzewski, David Tudor, Pauline Oliveros, Julius Eastman, Petr Kotik, and many more. Composers John Cage, James Tenney, Iannis Xenakis and others all figure in the story as well. 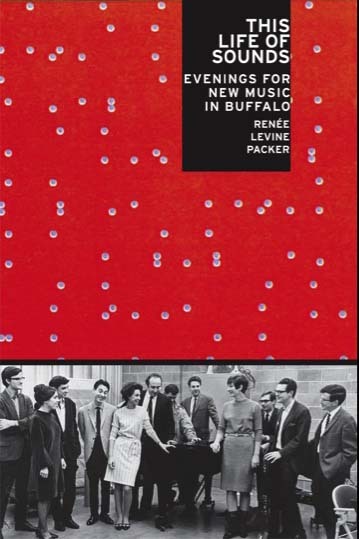 Renée Levine Packer brings the Center to life with her depiction of their passion, energy, and the impact these committed artists had on the history of new music composition. This Life of Sounds is necessary reading for students and scholars interested in institutional and community histories, twentieth-century American music and its cultural infrastructure, and arts funding issues in the United States, as well as fans of contemporary and experimental music. This Life of Sounds was released in paperback in Fall 2016.